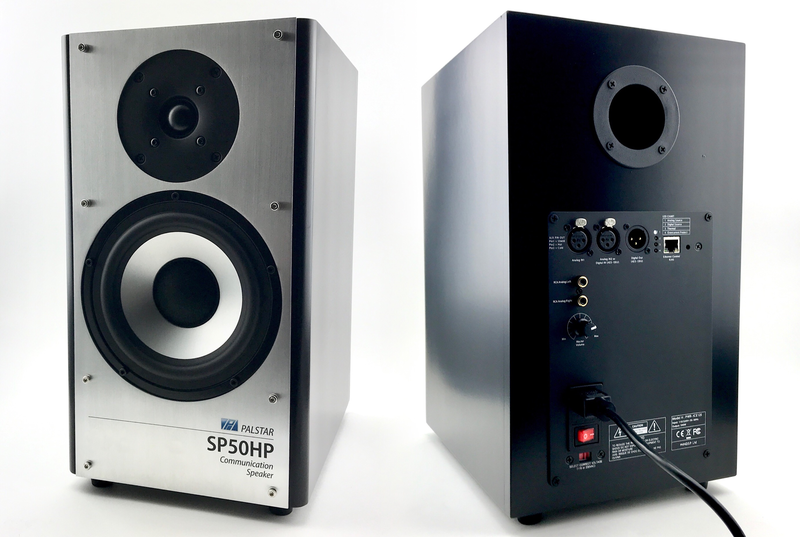 The Palstar SP50HP POWERED is a new studio monitor quality communications powered speaker featuring a 60 Watt internal amplifier, Bluetooth connectivity with optional external module, and single monaural output (with one speaker) or dual monaural/stereo L&R speaker outputs (with two speakers). The SP50HP is a custom engineered speaker designed to both match the sonic characteristics of the human voice (70Hz to 5kHz) and via a software-based DSP interface configuration to also offer the full frequency range (20Hz to 20Khz) for high-quality music and audio-visual listening. The processing of the audio signal is via an innovative DSP software interface & firmware allowing a Plug & Play real time control of the onboard DSP over Ethernet/Wifi networks. Using our Zero Conf technology, multiple modules are automatically discovered and controlled from a single User interface in real time that can be accessed via a desktop computer or mobile devices. The onboard Digital Signal Processors (DSP) provide real time processing. These include FIR and IIR filters (biquad input), Parametric Equalizers (PEQ), level, crossovers, comp/limiter, delay and more. The Graphical User Interface (GUI) platform is supported on both Mac and Windows environment. The "H" stands for both high quality and high power, because the SP50H can handle a maximum 60 Watts RMS of audio power, and measures 15" high X 8.5" wide" X 11.75" deep. The SP50HP POWERED features an internal 2 x 60 Watt amplifier that attenuates and re-amplfies the high-level amplified signal from your transceiver. The amplifier features DSP technology pre-configured for flat response, classical music, rock/jazz, and voice communications. The configuration selection is via a software-based DSP interface that will also allow the user to configure the speaker frequencies, type of crossover, and EQ digitally. The SP50HP POWERED takes communications speakers quality to the next level of audio that is only heard in professional recording studios and broadcast radio and television.